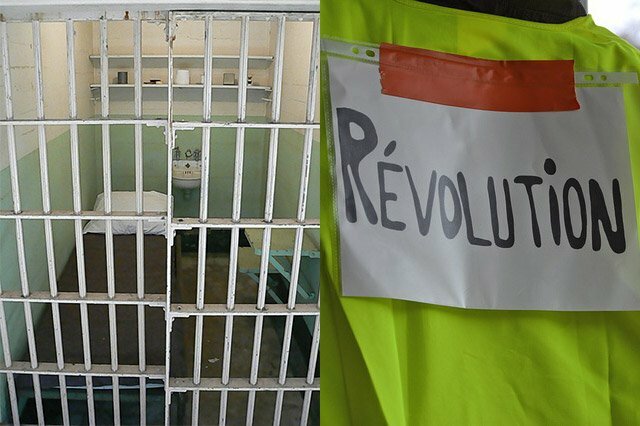 In another show of draconian power-tripping, the French government have sentenced a journalist to 6 months in prison for organizing the Yellow Vest protest. This comes as the protests enter their 10th week of consecutive protests, dubbed "Act X". President Emmanuel Macron’s government is stepping on the French constitutional guarantees of free speech in efforts to punish and suppress the Yellow Vests movement. 28-year-old journalist and movement leader Hedi Martin is the latest to face the wrath of the state to punish those who are involved with the protests. Martin was arrested on January 3 "one day after calling for protesters to blockade the coastal town’s oil refinery and “stand up to the CRS” (the French acronym for the national police)." His arrest didn't stop the protests though. If anything it seemed to awaken more people to the tyranny of the state and added fuel to the fire. The government has responded by increasing ratcheting up their police tactics by introducing "live ammunition-equipped semiautomatic Heckler & Koch G36 rifles". The tribunal president Philippe Romanello condemned Martin's call to protest on Facebook Live. It may have been the most effective way to be heard and mobilize people, but it's very public and put a spotlight on his activities. The judge tried to disparage the claims Martin made about "brutal and heavy-handed tactics of the national police" by implying a guilt for giving "the impression that you are at the center of information." Who knew being a popular person and telling the public about police brutality was a crime. Such are the times of universal deceit where telling the truth becomes a crime. "It’s not a matter of blaming him for carrying out an act (violence or public damage), but of participation in a violent movement." "... when you see guys beating up an unfortunate policeman on the floor, that’s when they should use their weapons once and for all. That’s enough!" In an attempt to address concerns from the Yellow Vests movement and demobilize them, anannoyed Macron expressed vulgarity and said some protesters were "doing the right thing", while others were "screwing around" with the system. This seems to have been met with backlash from politicians and people on both the left and right. The protests show no signs of stopping. Calls on Facebook are to grow larger and make more of an impression. This is what is will take to make things change. The more people that get into it, the more it becomes a force that can't be stopped and has to be listened to and dealt for real, not brushed aside, ignored, or suppressed with the state authoritarian power. There will likely be more arrests, but they can't arrest everyone.